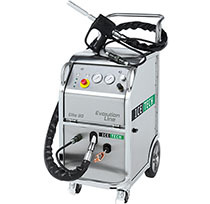 The Elite 20 ¾” is a versatile, heavy duty dry ice blasting machine that can be used for light, medium up to tough applications with low dry ice consumption. With 3/4” blasting hose, the Elite 20 is an ideal solution for cleaning more demanding surfaces. Dry ice blasting machines and accessories are designed to minimize the costs of equipment and plant maintenance. When using dry ice blasting it is possible to clean devices online, without any dismantling and subsequent reassembly. Production downtime can be avoided or reduced drastically, supporting an economical approach to facility maintenance. Póngase en contacto con nosotros para conocer las soluciones específicas para sus necesidades de limpieza.